This film has been kept away from the critics prior to release, which is never a good sign. 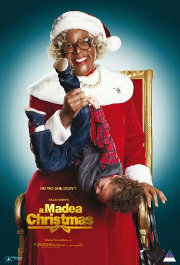 Madea gets coaxed into helping a friend pay her daughter a surprise visit in the country for Christmas, but the biggest surprise is what they'll find when they arrive. As the small, rural town prepares for its annual Christmas Carnival, new secrets are revealed and old relationships are tested while Madea dishes her own brand of Christmas Spirit to all. What do you mean I am too ugly to be a Father Christmas?